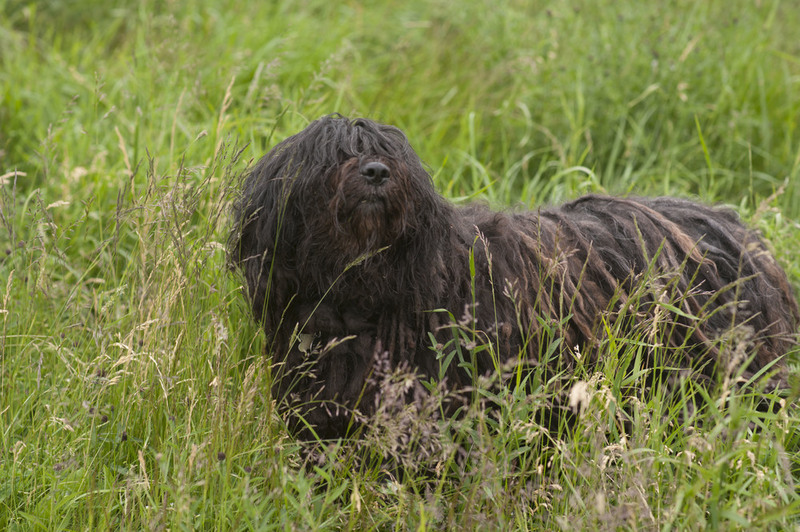 The Bergamasco is an ancient shepherding breed which traces its origins back thousands of years. Believed to have originated in Persia (in the area that is now Iran), hardy, vigorous shepherding dogs worked with their nomadic masters, tending and herding flocks of sheep in the harsh mountain climates from Persia west to Europe. Certain of these nomads ultimately settled in the Italian Alps and remained there; their dogs became what is now known as the Bergamasco. Bergamascos worked closely with their shepherds in a one-to-one relationship, the goal of which was to protect the flock. Unlike some other shepherding breeds, which are taught to execute exact commands from their masters, the Bergamasco enjoyed a unique partnership with its shepherd in the isolated high mountain valleys: with just one human, a small number of dogs, and hundreds of sheep to tend, the shepherd needed his helpers to be as independent as possible, and so the Bergamasco was developed to problem-solve on its own. Thus, while it learned to take its lead from its shepherd, the manner in which it accomplished what the shepherd wanted was left up to it. And so, it learned to identify problems and to think its way through them, and to accomplish the goal in whichever way seemed best, given the always changing circumstances in the mountain valleys. As a result, Bergamascos developed into a highly intelligent breed that combines a deep desire to please and help its master with an ability to think for itself and to figure out its own ways to accomplish the mutual goals. Thus, to a certain extent, it for good reason sees itself more as an equal working partner than as an inferior subordinate. This makes the Bergamasco an excellent choice for a person who appreciates intelligence and self-sufficiency in a companion. Bergamascos began to mongrelize and were in danger of becoming extinct after World War II, when wool production fell off and there was less need for shepherding dogs. Dr. Maria Andreoli, an Italian breeder, was instrumental in saving the breed before it became extinct. As a trained scientist, she was able to study and observe the genetic traits of the breed, and through 40 years of careful breeding has developed many lines of champion dogs. It is largely due to Mrs. Andreoli and her Dell' Albera kennel that good, established reliable bloodlines were developed, and it is through her generous help and sharing of her knowledge and expertise that the Bergamasco has been able to be so successfully introduced and developed in the US.